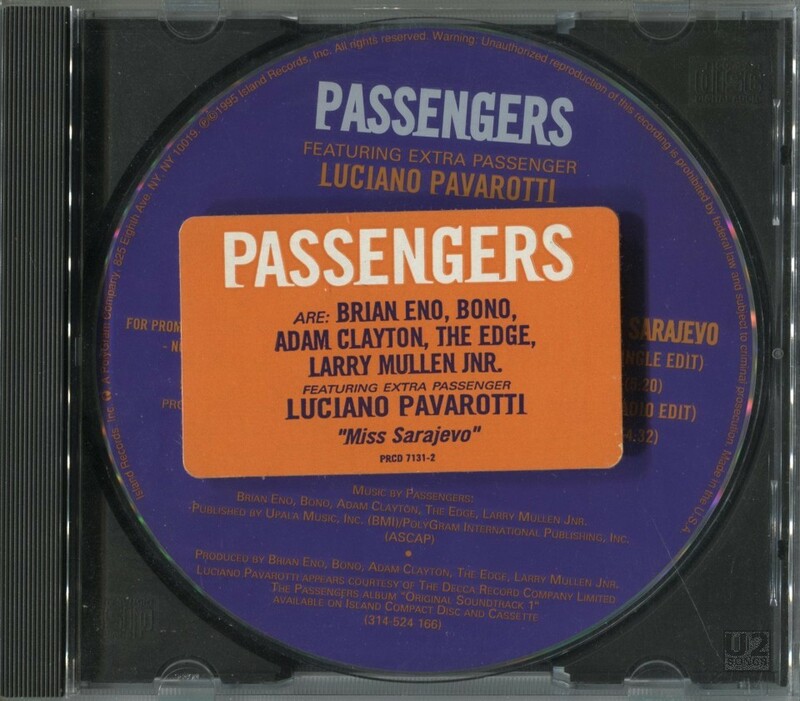 Passengers was a U2 project which included Brian Eno as a full fledged member of the group, as well as other performers as part of the group. “Miss Sarajevo” was the first single released to promote the album by Passengers, “Original Soundtracks 1”. The track featured the extra “Passenger” Luciano Pavarotti guesting on vocals. There are three different edits of the title track, the album version which comes in at 5:41, the “Single Edit” at 5:20 in length, and the shortest version, the “Radio Edit” at 4:32 in length. The single was released on a promotional 7-inch. This was distributed for use in juke boxes, and was released in a plain white diecut sleeve with no markings. The label was molded into the vinyl and is not a paper label which would be more common on commercial releases. The 7-inch was produced in France for use throughout Europe and the UK. It featured the “Single Version” of the title track as well as “One (Live from Modena)”. In the UK a 5-inch promotional CD was pressed which matched the commercial single with the exception of containing the “Radio Edit” of the song. It came in a slimline jewel case with inserts that were the same as the commercial single. However, the front of the jewel case was stickered with a different catalog number and said “Radio Edit” on the sticker. The other three tracks on this version of the promotional single were identical to the commercial single: “One (Live from Modena)”, “Bottoms”, and “Viva Davidoff”. In the USA a 5-inch CD was also produced for promotion. It was released with a generic Island back insert in a regular jewel case. No front cover was included. However, the front of the jewel case was stickered with a unique sticker which announced the members of Passengers as well as the title of the CD and the catalog number. This 5-inch CD contained both the “Single Edit” of the song, as well as the “Radio Edit” of the song. Some copies of this promotional single came with no inserts or sticker, just the CD in a regular jewel box. The value of the CD is improved if it contains the back insert and the sticker. Miss Sarajevo (Single Version): Music by Passengers (Brian Eno, Bono, Adam Clayton, The Edge, Larry Mullen Jnr.) featuring extra Passenger Luciano Pavarotti. Engineered by Danton Supple. Assisted by Rob Kirwan. Additional engineering by Ruadhri Cushnan. Mix by Jeremy Wheatley. String Arrangement by Craig Armstrong. Special thanks to Anna Mazzarotto for lyric translation.